Yueyang was called Baling, though it was also known as Yuezhou in ancient times. It is located at the juncture of the Dongting Lake and the Yangtze River in northern Hunan. As a famous historical and cultural city and a major tourism area, Yueyang has beautiful scenery and lots of places of interest. Of over 20 scenic spots, the most famous ones are the Yueyang Pavilion, the Junshan Mountain, the Memorial Temple of Qu Yuan and the Tuanhu Lake. Towering above the west gate of Yueyang City, it is one of the three famous pavilions in South China. Built in the fourth year of the Kaiyuan Reign in the Tang Dynasty (716), it became more famous after Fan Zhongyan's "On Yueyang Pavilion" was written and spread out. Fan is a wellknown writer of the Song Dynasty. It was built in memory of Qu Yuan, a great patriotic poet in ancient China. Feeling disappointed with saving the country, he drowned himself in the Miluo River. 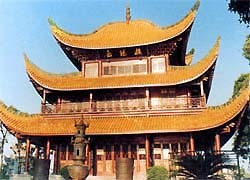 The temple is on the Yusishan Mountain in Miluo of Yueyang. The building, made from wood and brick, is one story high with single eaves. Poetry and proses grieving the death of Qu Yuan are inscribed on the four stone walls. In the front hall is a huge wooden board inscribed with The Biography of Qu Yuan by Sima Qian. The lake, also known as Lotus Lake, isabout20kmaway from Yueyang Proper and covers an area of 200 hectares. In summer and autumn, the blossoms of the lotus appear among the green leaves creating a beautiful sight and making visitors not want to leave.